PAYDAY BOARD GAME One thing you tend to find with board games is that the good ones stick around, whereas the dross fades away quickly from view! In the case of Payday the game has been around since way back in 1975, and you just don’t get that longevity for bad games. Payday is ..
One thing you tend to find with board games is that the good ones stick around, whereas the dross fades away quickly from view! In the case of Payday the game has been around since way back in 1975, and you just don’t get that longevity for bad games. Payday is (in our view) close to everything that a compelling family board game should be. The game is quick, it allows parents and kids to play on a relatively even level i.e. parents don’t get a huge advantage due to being adults, and kids therefore have as much of a chance of winning as the adults. The game also includes oodles of money, and is based around the typical monthly cashflow cycle between ‘paydays’. This enables kids to learn about how money works, gets them counting in a fun way, and gets them making simple decisions about what to do with their money. The social dynamic created by this game is reasonably strong with considerable interaction during turns due to players having to pay other players money and all wanting to win the considerable sums of money that collect in a Jackpot pile until someone wins. In terms of gameplay dynamic, Payday is emphatically simple. Roll the dice, move and o what it says on the space you land on. Sometimes this means taking a new card, sometimes it means buying an investment or paying money to another player. It doesn’t take very long to go round the board to reach one Payday, so players have to decide in advance how many times they will go round the board. A quick 2 lap game may take as little as 10-15 minutes, which is amazingly short compared to some traditional old school family games! Payday has everything needed to be THE family game played by families regularly and on special occasions such as Christmas. 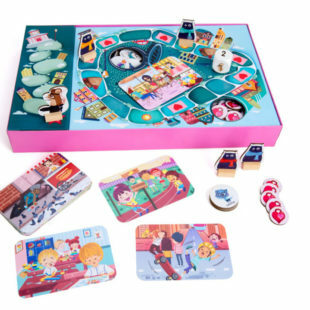 WHO’S IT FOR – this is a classic family game, and while the box states the game is for kids aged 8+, we’d expect kids of 7+ to be able to play with a little help. Kids of a younger age may struggle with reading the board/cards. THE TOY VERDICT – We love Payday! It’s a really strong, long proven gameplay with a simple and quick play experience. Highly recommended.